The April 2019 Credit Union Trends Report is now available. Financial institutions affected by the data breach at Wendy’s restaurants can now file their claims and find additional information at a Web site established as part of the settlement of that case, wendysfidatabreachsettlement.com. It contains a mechanism for filing claims, as well as additional information, frequently asked questions, a list of important deadlines and court documents. ALEXANDRIA, Va. – Low-income credit unions affected by Midwest floods can apply for urgent needs grants up to $7,500 from the National Credit Union Administration. The March 2019 Credit Union Trends Report is now available. Jim Nussle, CUNA president/CEO, released a statement after National Credit Union Administration (NCUA) Chairman J. Mark McWatters and board member Rick Metsger spoke at the 2019 Credit Union National Association Governmental Affairs Conference (CUNA GAC). Credit Union National Association (CUNA) announced election results for its Board of Directors Executive Committee Members. Brett Martinez, President & CEO of Redwood Credit Union (RCU), was elected as the CUNA Board Chair. Martinez addressed the CUNA Governmental Affairs Conference (GAC) yesterday for the first time as Board Chair. Credit Union National Association (CUNA) President/CEO Jim Nussle took to the main stage at the Governmental Affairs Conference (GAC) Monday morning to address from the more than 5,000 credit union advocates in attendance during his keynote speech. EAST HANOVER, N.J. – The Symbionce Board of Directors is pleased to announce MaryAnn Lunetta has been appointed as Chief Operating Officer of Symbionce Financial Solutions, LLC. MaryAnn brings to Symbionce over 25 years of operations and executive management leadership in the credit union and banking industries. Welcome to National Consumer Protection Week (NCPW) 2019. This marks 21 years of commemorating the important work that the Federal Trade Commission (FTC), state attorneys general offices and many community partner organizations do to protect consumers across the country. Junior Achievement (JA) announced that it will honor the National Credit Union Foundation (the Foundation) with the 2017-2018 U.S. Gold President’s Volunteer Service Award on behalf of America’s Credit Unions for providing over 15,000 volunteer hours to Junior Achievement USA. The February 2019 Credit Union Trends Report is now available. The number of elder financial exploitation (EFE) suspicious activity reports (SARs) filed by financial institutions quadrupled between 2013 and 2017, according to a new report released Tuesday by the Consumer Financial Protection Bureau (CFPB). In addition, nearly 80% of these filings involved monetary loss to individual or financial institution. The National Credit Union Administration (NCUA) Wednesday issued a Notice of Funding Opportunity (NOFO) to announce the availability of loan awards for low-income designated credit unions (LICUs) through the CDRLF program. MADISON, Wis. – Registration is now open for the Credit Union FINHEALTH19 Conference taking place April 24-26, 2019 in Las Vegas, Nev., with the opportunity for scholarship assistance through the National Credit Union Foundation (the Foundation). The deadline is approaching to purchase tickets and sponsorships for the 31st annual National Credit Union Foundation Dinner Presenting the Herb Wegner Memorial Awards on March 11, 2019 at the Marriott Marquis in conjunction with the Credit Union National Association (CUNA) Governmental Affairs Conference (GAC) in Washington, D.C.
National Consumer Protection Week Starts Next Week! The Federal Trade Commission (FTC) is excited that National Consumer Protection Week (NCPW) is just around the corner and they hope you’ll check out the events they have planned. During NCPW, they join their partners to bring you information and advice on scams, identity theft, and other consumer protection issues. MADISON, Wis. – Junior Achievement (JA) announced that it will honor the National Credit Union Foundation (the Foundation) with the 2017-2018 U.S. Gold President’s Volunteer Service Award on behalf of America’s Credit Unions for providing over 15,000 volunteer hours to Junior Achievement USA. Nearly 500 employees of the Marcal paper products facility in Elmwood Park have lost their jobs due to the 10-alarm fire that destroyed the plant on January 31. MADISON, Wis. – The National Credit Union Foundation (the Foundation) and Members Development Company (MDC) are collaborating to bring credit unions additional value and resources on consumer financial health. The Foundation and MDC have a joint membership in the Center for Financial Services Innovation’s (CFSI) Financial Health Network. MADISON, Wis. – Credit union leaders and emerging leaders can still register for the National Credit Union Foundation’s (the Foundation) 2019 Credit Union Development Education (DE) Trainings taking place in Madison, Wis.
Reducing debt is the top financial priority in 2019 for roughly three-quarters of parents, according to a survey recently released by New York Life. While two-thirds of respondents said they plan to save more this year, 30 percent plan to seek expert advice for financial planning. The January 2019 Credit Union Trends Report is now available. America’s credit unions are embodying their structure and mission to ensure their members affected by the government shutdown have access to low- or no-interest loans with generous repayment terms. An estimated 800,000 federal employees and their families are facing financial uncertainty because they aren’t being paid during the shutdown. CUNA is currently collecting information regarding the assistance credit unions across the nation are providing. While U.S. student loan debt has more than doubled in the past decade hitting a record high of $1.36 trillion in the third quarter of 2018, delinquency rates have been declining according to new data. MADISON, Wis. – The National Credit Union Foundation (the Foundation) has approved grants totaling $54,000 for three organizations to work with the Center for Financial Services Innovation (CFSI) to develop financial health-related key performance indicators (KPIs) to measure the financial health and business impacts of their products and services. MADISON, Wis. – The National Credit Union Foundation has announced a staff transition that will see three current employees take on exciting new roles with an increased focus on demonstrating the impact of Foundation programs and growing the number of Foundation supporters. Federally-insured, low-income credit unions that want to become certified Community Development Financial Institutions (CDFI) can apply to use the National Credit Union Administration (NCUA)’s qualification process for streamlined CDFI certification from Jan. 13 through Feb. 9. The agency’s Office of Credit Union Resources and Expansion hosts a resource page with details about certification and the streamlined process. MADISON, Wis. — Join CUNA, along with The Cooperative Trust, on June 13-14th in Madison, Wisconsin, for the chance to network with other future leaders in the industry and discover new perspectives and strategies for guiding your credit union to success. The December 2018 Credit Union Trends Report is now available. The deadline for nominations for the 2019 CUNA Director elections has passed and five Directors have been elected by acclamation. The Vote For Miracles campaign wrapped up another successful campaign in 2018, with Hurley Children’s Hospital in Flint, Mich., netting the most votes and securing a $50,000 donation from CO-OP Financial Services. The annual contest, part of Credit Unions for Kids, allows credit union members and employees to vote for their favorite Children’s Miracle Network Hospital. Tickets and sponsorships are now available for purchase for the 31st annual National Credit Union Foundation Dinner Presenting the Herb Wegner Memorial Awards on March 11, 2019 at the Marriott Marquis in conjunction with the Credit Union National Association (CUNA) Governmental Affairs Conference (GAC) in Washington, D.C.
CUNA announced that Malcolm Gladwell, author of New York Times bestselling books such as The Tipping Point and Blink, will deliver a keynote address at the 2019 CUNA Governmental Affairs Conference (GAC). Noting a 60 percent increase in "bogus" email schemes seeking to steal money or tax data in 2018, the IRS Tuesday warned consumers to be on the lookout for "new, sophisticated email phishing scams" during the holidays and the 2019 tax filing season. The Federal Housing Finance Agency (FHFA) announced Tuesday its maximum conforming loan limits for mortgages acquired by government-sponsored enterprises Fannie Mae and Freddie Mac will increase in 2019 to a level of $484,350, an increase from $453,100 in 2018. ALEXANDRIA, Va. – The National Credit Union Administration (NCUA) has selected Andrew Leventis as its new Chief Economist. SALT LAKE CITY, UT – With the simple click of a mouse, credit union members and employees can make a difference in the lives of sick and injured children in their community. The Internal Revenue Service (IRS) and Security Summit partners Monday warned the public of a surge of fraudulent emails impersonating the IRS and using tax transcripts as bait to entice users to open documents containing malware. To help advance a key component of Gov. Phil Murphy’s comprehensive economic plan, the NJ Economic Development Authority (NJEDA) announced it has realigned operations to better foster a dynamic, supportive environment for the state’s entrepreneurs and small businesses, including the creation of a new dedicated small business unit. This follows other recent efforts of the NJEDA focused on increasing access to growth capital for historically underrepresented businesses. MADISON, Wis. – The National Credit Union Foundation (the Foundation) is working closely with staff at the California and Nevada Credit Union League to direct disaster relief funds to credit union people affected by wildfires in Northern and Southern California. The Federal Open Market Committee (FOMC), the Federal Reserve's monetary policy-setting arm, begins a two-day meeting today. A rate hike is not expected following this meeting, but one is widely anticipated at the conclusion of its December. The October 2018 Credit Union Trends Report is now available. ALEXANDRIA, Va. – National Credit Union Administration (NCUA) Chairman J. Mark McWatters congratulated Chief of Staff Sarah Vega on her selection as President and Chief Executive Officer of the Cooperative Credit Union Association and thanked her for her long and valuable service to the NCUA. MADISON, Wis. – The National Credit Union Foundation (the Foundation) has opened CUAid to receive disaster relief funds to assist credit union people affected by Hurricane Michael; a Category 4 hurricane that has caused catastrophic effects across Florida and Georgia and is expected to reach the already hurricane-soaked Carolinas. MADISON, Wis. – 45 credit union professionals were certified as Credit Union Development Educators (CUDEs) after completing the National Credit Union Foundation’s Credit Union Development Education (DE) Training. America’s credit unions were on full display last weekend at the National Cooperative Business Association’s (NCBA) CO-OP Festival on the National Mall in Washington, D.C. Credit union volunteers manned a tent during the festival that featured a money machine for visitors to step inside and see how much play money they could grab. MADISON, Wis. – The National Credit Union Foundation (the Foundation) is pleased to announce the winners of the 2019 Herb Wegner Memorial Awards. Diana Dykstra and Crystal Long will be recognized with Outstanding Individual Achievement Awards, and Nusenda Credit Union Foundation will be recognized as an Outstanding Organization by the Foundation. Lending and membership growth a trend of historically strong performance for credit unions according to the August Monthly Credit Union Estimates from CUNA. The cycle for the 2019 Credit Union Development Education (CUDE) scholarships from the National Credit Union Foundation is now open. These scholarships – provided by the DE Founders Fund – offer registration support for up to eight candidates to attend one of the Foundation’s 2019 DE Programs. These scholarships are intended to support those individuals that cannot get institutional support to attend, those from smaller credit unions and international students who may have difficulty in finding the necessary funding. Credit Union Magazine has announced 2018’s Credit Union Rock Stars, professionals and volunteers in the credit union industry whose innovations, service and achievements have made an outstanding contribution to their communities and the credit union movement. MADISON, Wis. – The National Credit Union Foundation (the Foundation) is currently seeking nominations for four board seats. Volunteers may generally serve up to three terms of the duration of the term of office for the seat they are selected, as long as they are re-nominated by the Foundation Nominations Committee and re-elected by the Foundation Board. Federal officials are stepping up their warnings to large U.S. banks as some of them have seen an increase in attempted cyberattacks recently. In our current robust economy, the more informed you are, the more able you are to take advantage of long-term opportunities for growth. Get the answers to your questions directly from CUNA senior economist Jordan van Rijn at the CUNA 2018 Economic Update Webinar, October 30th at 11 a.m. ET. In addition to taking attendee questions, topics Jordan will be covering include: current trends affection credit union operations, updated CUNA economic forecasts, and credit unions' role in serving the underserved. How CU Lending Makes a Difference, Tell Your Story Today! CUNA and the Leagues are encouraging credit unions to share stories about how their lending activities have made positive differences in the communities they serve. Stories can be submitted to CUSocialGood.com. These stories are extremely valuable to credit union advocacy efforts. Credit unions are more likely to prioritize investing in digital channel functionality than global, regional and community banks. However, more than one-quarter of credit union executives believe their digital investments are "too high." Although not a top priority, credit unions are also investing more in ATMs than global or regional banks. MADISON, Wis. – The National Credit Union Foundation’s (the Foundation) board of directors has approved nine new Biz Kid$ Financial Education Grants for 2018-2019, totaling $53,100. These grants are distributed to encourage credit union organizations to use Biz Kid$ and its curriculum to improve students’ financial well-being. Biz Kid$ is the credit union funded public television series that teaches kids about money management and entrepreneurship. The New Jersey Credit Union League (NJCUL) and CUNA invite New Jersey credit unions to register for the 2019 CUNA Governmental Affairs Conference (GAC) scheduled for March 10-14, 2019 in Washington D.C.
MADISON, Wis. – The National Credit Union Foundation (the Foundation) has opened CUAid to receive disaster relief funds to assist credit union people affected by Hurricane Florence; a Category 2 hurricane expected to cause catastrophic effects throughout the Carolinas, Virginia, and potentially Georgia. ALEXANDRIA, Va. – The video recording of the Aug. 2, 2018, open meeting of the National Credit Union Administration (NCUA) Board is now available on the agency’s Web site. With over half of the U.S. population struggling financially, the time is now to focus on your members' financial health. No matter where your credit union is on its financial health journey, Credit Union FINHEALTH19 will bring together leading experts and practitioners to help you engage with your members and communities and improve the financial health of your most important asset - your members. The August 2018 Credit Union Trends Report is now available. During a speech at a Federal Reserve Bank of Kansas City sponsored symposium Friday, Fed Chairman Jerome Powell defended the current pace of normalizing monetary policy consisting of gradually raising the federal funds target rate and declining its security holdings. MADISON, Wis. – 85 graduates of the 2018 CUNA Management School, held July 15-25, earned their Certified Credit Union Executive (CCUE) designations. Awarded upon completion of all three years of the school, the designation signifies full knowledge of and preparedness for credit union leadership. CUNA and the league system are seen as the most influential financial services organizations and one of the most effective advocacy organizations in Washington, according to an independent study conducted by Ballast Research (formerly National Journal Research). Once again, CUNA is the leading association at representing the interests of its members, due to its success in creating the credit union narrative and sharing their story among Washington policymakers. The 70th annual International Credit Union Day (ICU Day) is set for October 18. This year, the day’s main theme will be to “find your platinum lining in credit unions”. MADISON, Wis. – The National Credit Union Foundation (the Foundation) is working closely with staff at the California and Nevada Credit Union League to direct disaster relief funds to credit union people affected by wildfires in Northern California; the worst wildfires in the history of the state. ALEXANDRIA, Va. – Financial regulatory agencies, non-profits, schools financial institutions, and the military must work together to improve the personal finance knowledge of service members and their families to prevent them from being financially exploited, NCUA Board Chairman J. Mark McWatters said this week. WASHINGTON – Credit Union National Association (CUNA) announced four new appointments to help drive credit union success. ALEXANDRIA, Va. – Minority credit unions play a vital role in providing affordable financial services in the nation’s most underserved communities and the agency is looking at new ways to support them, National Credit Union Administration (NCUA) Board Chairman J. Mark McWatters said. National Credit Union Foundation releases brief linking financial wellness to overall physical wellness and what to do about it. MADISON, Wis. – The National Credit Union Foundation (the Foundation) released a special brief entitled, “Health and Financial Well-Being: Two Good Things That Go Better Together” describing the need for financial service and health care professionals to collaborate to improve outcomes for the individuals they serve. Reminder: ‘Stop the Data Breaches’ Webinar Taking Place Today at 3 P.M.
Credit union stakeholders can still register for today’s free webinar on CUNA’s latest Member Activation Program (MAP) campaign, Stop the Data Breaches. This webinar is free to CUNA members, and is scheduled to start at 3 p.m. (ET) today, July 31. The July 2018 Credit Union Trends Report is now available. ALEXANDRIA, Va. – The video recording of the June 21, 2018, open meeting of the National Credit Union Administration (NCUA) Board is now available on the agency’s Web site. Credit union organizations can now apply for a Bite of Reality App Grant from the National Credit Union Foundation (the Foundation) through August 31, 2018. The Foundation is looking to distribute up to $50,000 in grant funds to credit union organizations as part of this effort. The cybersecurity research firm IntSights released a report last week examining threats faced by financial institutions, which found that the amount of credit card information for sale on the dark web has roughly quadrupled over the past two years, with a 135 percent increase from the first half of 2017 through the first half of 2018. Lending and membership growth led strong credit union results in May, according to the latest Monthly Credit Union Estimates. CUNA President/CEO Jim Nussle introduced the “why” of the Creating Awareness Initiative Friday at the CUNA America’s Credit Union Conference. Forbes recently partnered with market research firm Statista to produce its first-ever Best-In-State Banks and Credit Unions ranking. In total, 124 banks and 145 credit unions made the final cut, equaling 2.4% of U.S. financial institutions. Credit unions outpaced banks with an average score of 80 versus 75.2 for banks. Customers also rated CUs higher than banks: 4.42 for credit unions and 4.24 for banks, on a scale of 1 to 5. Do you participate in CU Webinar Network (CUWN) webinars? We have some good news! CUWN will soon be making a series of email enhancements. These changes will help serve you better, delivering information on webinars and training tailored to your wants and needs. Simply stated: fewer emails, more relevant content, everyone goes home happy. CUNA intends to raise $100 million over the next three years to fund and sustain a research-driven national credit union awareness program, CUNA President/CEO told attendees at America’s Credit Union Conference (ACUC) in Boston on Friday. America’s credit unions and business partners, with support from CUNA, set the funding goal to launch in the digital marketplace through 2021. MANCHESTER, N.H. – The CUNA Research Library at America’s Credit Union Museum was unveiled Wednesday at a ribbon-cutting ceremony. Credit Union Day at Yankee Stadium! On behalf of our good friends to the North, the New York Credit Union Association, we want to make you aware of Credit Union Day at Yankee Stadium being held on Thursday, August 16th. ALEXANDRIA, Va. – Share insurance is a fundamental part of the nation’s credit union system, and credit union professionals can learn more about how it works on two upcoming webinars hosted by the National Credit Union Administration (NCUA). MADISON, Wis. – The National Credit Union Foundation (the Foundation) is looking for credit unions to submit proposals to work with the Center for Financial Services Innovation (CFSI) to develop financial health-related key performance indicators (KPIs) to measure the financial health and business impacts of their products and services. The deadline for credit unions to submit their applications is August 31, 2018. Children's Hospital of Philadelphia (CHOP) announced a major expansion plan off its Main Campus, calling for the construction of a new inpatient hospital in King of Prussia, PA. Madeline Bell, President and CEO, made the announcement at a press conference held at CHOP’s King of Prussia Specialty Care & Surgery Center. MADISON, Wis. – 47 credit union professionals were certified as Credit Union Development Educators (CUDEs) after completing the National Credit Union Foundation’s Credit Union Development Education (DE) Training. ALEXANDRIA, Va. – The video recording of the May 24, 2018, open meeting of the National Credit Union Administration (NCUA) Board is now available on the agency’s Web site. Report Your Classroom/Community Financial Literacy to the NYIB! Be Counted! Are you, or someone at your credit union, conducting financial education presentations in classrooms or partnering communities? If so, you should be reporting your numbers to the National Youth Involvement Board (NYIB)! CUNA announced three senior staff promotions Monday. At the Federal Trade Commission (FTC), our mission is to protect consumers, including small business owners. That’s why, when we see scammers taking money from small businesses, we step in. The FTC announced Operation Main Street: Stopping Small Business Scams, a coordinated law enforcement and education effort with state and federal partners, as well as the Better Business Bureau (BBB),to stop scams that target small businesses. MADISON, Wis. – The National Credit Union Foundation (the Foundation) has announced the addition of Brian Griffith, CUDE, as the new Director of Marketing and Communications, effective July 16, 2018. Griffith will lead all the Foundation’s marketing, communications and public relations strategy and execution. CUNA Councils has officially launched their 2018 All In campaign. Starting in 2015, the annual campaign encourages credit unions to unlock the full value of CUNA Councils by signing up one credit union professional for each Council. The 2018 CUNA Regulatory Compliance Certification Schools, held in New Orleans, brought together 210 professionals, who earned or recertified their Credit Union Compliance Expert (CUCE) designation. Credit union supporters are encouraged to nominate individuals and organizations for the Herb Wegner Memorial Awards to be presented by the National Credit Union Foundation (the Foundation). ALEXANDRIA, Va. – The National Credit Union Administration released today the second quarter edition of its online newsletter. MADISON, Wis. – The National Credit Union Foundation (the Foundation) has released their 2017 annual Impact Report entitled, “The Power of Your Giving”. This report highlights the work of the Foundation in 2017 to improve people’s financial lives through credit unions. MANCHESTER, N.H. – America’s Credit Union Museum (ACUM) today announced the appointment of Chuck Fagan and Lois Kitsch to its Board of Directors. ALEXANDRIA, Va. – Low-income credit unions interested in applying for Community Development Revolving Loan Fund grants this year can obtain valuable information on an upcoming webinar hosted by the National Credit Union Administration. The Financial Crimes Enforcement Network (FinCEN) issued an administrative ruling on Wednesday, May 16, 2018 to provide a 90-day limited exceptive relief to covered financial institutions from the obligations of the Beneficial Ownership Requirements for Legal Entity Customers (Beneficial Ownership Rule) with respect to certain financial products and services that automatically rollover or renew (i.e., certificate of deposit (CD) or loan accounts) and were established before the rule’s Applicability Date, May 11, 2018. Third-party vendors play a vital role as you strive to remain competitive and look to efficiently expand member services. When forming new vendor relationship or maintaining existing ones, it’s critical to ensure you have a process to manage potential risks. ALEXANDRIA, Va. – There is still time to register for the National Credit Union Administration’s May 16th webinar on becoming designated as a Community Development Financial Institution. Some Chili's Grill & Bar restaurants were impacted by a data breach between March and April this year compromising customers' credit and debit card information. ALEXANDRIA, Va. – The video recording of the April 19, 2018, open meeting of the National Credit Union Administration Board is now available on the agency’s Web site. MADISON, Wis. – 46 credit union professionals became Credit Union Development Educators (CUDEs) after being guided by dedicated program facilitators and mentors through the intensive Credit Union Development Education (DE) Training from the National Credit Union Foundation (the Foundation). The DE training was held April 18 – 24, 2018 at the Lowell Center in Madison, Wis.
ALEXANDRIA, Va. – The National Credit Union Administration Board has revised its 2018 meeting schedule. The National Credit Union Foundation has announced the promotion of Andrew Johnson to Senior Program Manager. National Credit Union Foundation Executive Director Gigi Hyland appeared on CUBroadcast this week to talk about financial health in the credit union system, and how credit unions can evolve their focus on financial literacy. ATLANTA – Equifax Inc. this week released the results of its annual Financial Literacy Survey, in which an overwhelming number of surveyed respondents said they thought personal finance should be a required course to graduate from high school. This is the third year Equifax has conducted the survey. The April 2018 Credit Union Trends Report is now available. Change a Child’s Life with Pocket Change! Help out your local Children’s Miracle Network Hospital this Spring by participating in the Credit Unions for Kids’ Change a Child’s Life Coin Collection Campaign! It is a great way to engage members in your fundraising initiatives. Simply place the canisters at your teller stations and member services representatives’ desks and invite members to donate their loose change when they stop by the branch. It’s very easy for members to donate the change from a check they are depositing. Remember, a little bit goes a long way! The 2018 CUNA Collections & Bankruptcy School has been set for Sept. 17-20 in Orlando, Fla. Designed for collections professionals of all experience levels, the school provides a credit union-specific view of best practices, regulations and hot topics in collections and bankruptcy. Credit unions were well represented at this year’s Financial Literacy Hill Day, as CUNA and the National Credit Union Foundation manned a booth at the Hart Senate Office Building during the day’s event. Today is the deadline to file 2017 income taxes. If you haven't started filing yet, the IRS recommends using e-file or IRS Free File. Doing so reduces tax return errors as the tax software does the calculations, flags common errors, and prompts taxpayers for missing information, according to the IRS. MADISON, Wis. – Biz Kid$ has been nominated for a National Daytime Emmy Award for Outstanding Writing in a Children’s Program for Season 6 by the National Academy of Television Arts & Sciences. The awards presentation will take place on April 29th, 2018 in Pasadena, Calif.
Credit unions presented Children’s Miracle Network (CMN) Hospitals with a check for $380,000 Thursday, leading into this weekend’s Credit Union Cherry Blossom Ten Mile Run. The annual race has been sponsored by the credit union industry for 17 years, raising more than $8 million for 170 children’s hospitals around the country. CUNA staff joined with the Financial Services Information Sharing and Analysis Center (FS-ISAC) Thursday to host a webinar featuring NCUA staff on its new Automated Cybersecurity Examination Tool (ACET). NCUA developed ACET in 2017, piloted it in the third quarter and began ACET examinations in federally-insured credit unions with assets above $1 billion in December. ALEXANDRIA, Va. – The video recording of the March 15, 2018, open meeting of the National Credit Union Administration Board is now available on the agency’s Web site. For her commitment to and active involvement in financial education, National Credit Union Foundation (the Foundation) Executive Director Gigi Hyland has been named 2018 Financial Literacy Advocate by Franklin Mint Federal Credit Union (FMFCU). She will be formally honored April 19, 2018 at the annual FMFCU Partners in Education Celebration, a premier academic achievement recognition event being held at Drexelbrook Corporate Events Center, Drexel Hill, Pa. Membership and deposits growth highlighted the CUNA’s February Monthly Credit Union Estimates. Celebrated in April each year, National Donate Life Month features an entire month of local, regional and national activities to help encourage Americans to register as organ, eye and tissue donors and to celebrate those who have saved lives through the gift of donation. CUNA wrote to NCUA Friday to express it's appreciation for the agency's efforts to streamline the examination and supervisory process with an eye toward the future of the industry. The letter was sent in response to NCUA’s request for information on call report/profile content modernization. The New York Times released an article yesterday announcing that card data has been stolen from five millions customers of Saks and Lord & Taylor stores. Science is supposed to be fun, and the science of saving will be full of awesome fun for young savers during National Credit Union Youth Month. With the theme “The Science of Saving,” America’s youth are encouraged to picture themselves in the future to make saving easier in the month of April. ALEXANDRIA, Va. – Federally insured credit unions now can find online information about calculating and recording the planned Share Insurance Fund equity distribution from the National Credit Union Administration (NCUA). To support implementation of the 2016 Mortgage Servicing Final Rule, the Consumer Financial Protection Bureau (CFPB) has updated the Small Entity Compliance Guide. CUNA and the Financial Services Information Sharing and Analysis Center (FS-ISAC) will host a webinar with NCUA examiners to explain the new Automated Cybersecurity Examination Tool (ACET). The free webinar is scheduled for April 5, from 3 to 5 p.m. (ET), and registration is now open. Credit unions received high marks in the latest survey of financial institution members and customers from Consumer Reports. The March 2018 Credit Union Trends Report is now available. The operators of a deceptive and abusive debt collection scheme are banned from the debt collection business and from buying or selling debt under settlements with the Federal Trade Commission and the New York Attorney General’s Office. Early this year, credit unions across the country began receiving letters from a law firm, representing USAA Bank (USAA), inviting them to negotiate a patent licensing deal with USAA for the continued usage of remote deposit capture (RDC) technology. According to the letter, USAA was the first to develop and patent RDC technology. The law firm representing USAA claims the patent licensing campaign is an effort to recover “a small and fair portion” of the value USAA has provided to the financial industry. WASHINGTON — The Consumer Financial Protection Bureau (CFPB) issued a report on the 2017 activities of the Bureau and the Federal Trade Commission (FTC) to combat illegal debt collection practices. The annual report to Congress on the administration of the Fair Debt Collection Practices Act (FDCPA) details the agencies’ efforts to stop unlawful debt collection practices, including vigorous law enforcement, education and public outreach, and policy initiatives. To support implementation of the 2016 Mortgage Servicing Final Rule, the Consumer Financial Protection Bureau (CFPB) is releasing a number of Frequently Asked Questions (FAQs) that address some common questions the Bureau has received related to mortgage servicing. The FAQs uploaded today are on mortgage servicing provisions addressing certain bankruptcy-related topics. ALEXANDRIA, Va. – The video recording of the Feb. 15, 2018, open meeting of the National Credit Union Administration Board is now available on the agency’s Web site. ALEXANDRIA, Va. – Federally insured, low-income credit unions interested in becoming certified community development financial institutions may be eligible to use the National Credit Union Administration’s streamlined application. VALLEY FORGE, Pa. – Laying his personal life experience out for attendees, giving them a new perspective on what a hero is, Assistant Vice President of Marketing for SERVPRO, Kevin Brown, drove home the concept of showing up to life with the best version of yourself and deliver world-class performance to the people you serve. VALLEY FORGE, Pa. – "We are in a modern day civil rights movement," said Human Resources expert and CEO of Southwest Louisiana Credit Union Ronaldo Hardy Tuesday morning, as he asked attendees how they rate their culture of diversity, inclusion, and equity. VALLEY FORGE, Pa. – Influence isn’t something that we turn on and off. Influence means that your body language is consistent Monday to Monday. On Tuesday morning, author, body language expert, and credit union veteran, Stacey Hanke, gave attendees practical, tangible steps to take to be influential and stay influential. ALEXANDRIA, Va. – The National Credit Union Administration Board has added a second item to the agenda for its closed meeting scheduled for Wednesday, March 14, beginning at 1:30 p.m. Eastern. VALLEY FORGE, Pa. – Disruption can come in many forms. Leadership. Technology. Consumer expectations. Are you prepared? Rich Jones, President/CEO/Principal for the strategic planning company Leading2Leadership LLC, reviewed digital disruption that has already happened and what we can expect down the pike. VALLEY FORGE, Pa. – “To know where you’re going, you have to look back at where you’ve been,” said Filene Senior Impact Director Erin Coleman as she took attendees back in time to when Edward Filene and Roy F. Bergengren pioneered the credit union movement during her “Meet Your Future Member” session. VALLEY FORGE, Pa. – What are you currently doing to address emerging fintech companies? The majority of CU Reality Check attendees are “researching and seeking to understand,” according to poll results. Sam Das from CMFG Ventures used this as a launching point when presenting “Fintech: Friend or Foe” on Tuesday afternoon. VALLEY FORGE, Pa. – How can you be productively generous? This was a new concept for many attending the 2018 CU Reality Check conference. Wharton Researcher and Professor Reb Rebele introduced how to be generous while also being successful—and not depleting yourself of time and energy entirely. Every inspired idea has to start somewhere. For the African-American Credit Union Coalition (AACUC), it started with a simple conversation among a group of Georgia credit union professionals, who shared a desire to get to know other African-American professionals in their industry. NEW YORK – On behalf of America’s credit unions, the National Credit Union Foundation (the Foundation) was honored with the U.S. Gold President’s Volunteer Service Award for the 2016-2017 school year. This award was presented by Junior Achievement (JA) USA, an official certifying organization for this award, at JA’s 2018 Volunteer Summit on March 13th for the over 15,000 volunteer hours dedicated to Junior Achievement programs by America’s credit unions. VALLEY FORGE, Pa. – Drawing parallels between the tired, weary troops that arrived in Valley Forge years ago to recuperate and reinvigorate, and this week’s CU Reality Check conference attendees, Pennsylvania Credit Union Association President/CEO Patrick Conway welcomed attendees Tuesday morning. Thanking conference sponsors, attendees, and the board and staff members of the three collaborating credit union associations—the Maryland | DC Credit Union Association, the Pennsylvania Credit Union Association , and the New Jersey Credit Union League—he kicked off the 2018 Credit Union Reality Check Conference at the Valley Forge Casino Resort. TOMS RIVER, N.J. – In the “Things We Love” section of its Winter-Spring 2018 edition of its “Ocean View” magazine, Ocean County College highlighted the Financial Reality Fair program, which over the years has been integrated as a course component for the college’s transitional first year course. The article can be found on page 3. The National Credit Union Foundation (the Foundation) is looking for credit unions to submit proposals to work with the Center for Financial Services Innovation (CFSI) to develop financial health-related key performance indicators (KPIs) to measure the financial health and business impacts of their products and services. The deadline for credit unions to submit their applications is April 6, 2018. The Consumer Financial Protection Bureau (CFPB) issued a Request for Information (RFI) today on its complaint reporting process, the latest in a series of RFIs issued by the Bureau. Unfortunately, credit unions, banks and other financial institutions know all too well the potential effects distributed denial of service, or DDoS, attacks can have on information technology systems and Web sites. However, over the last year, credit unions, banks and other financial institutions have increasingly seen similar DDoS-style attacks that have left Automated Clearing House systems nearly incapacitated by massive amounts of fraudulent transactions. Lawmakers took to the stage on the last day of the CUNA Governmental Affairs Conference (GAC), and attendees brought their "A" game for the GAC Giveback event. CUNA President/CEO Jim Nussle took to the main stage at CUNA’s Governmental Affairs Conference (GAC) Tuesday afternoon to hear from the more than 5,200 in attendance during his town hall. WASHINGTON – Jim Nussle, CUNA president/CEO, released a statement after NCUA Board Member Rick Metsger spoke at the 2018 Credit Union National Association Governmental Affairs Conference (CUNA GAC) on Tuesday, February 27. WASHINGTON – The National Credit Union Foundation (the Foundation) presented four Herb Wegner Memorial Awards at its annual dinner Monday night at the Marriott Marquis in conjunction with the Credit Union National Association (CUNA) Governmental Affairs Conference (GAC) in Washington, D.C. Andy Janning, CEO and Founder of Man on Fire Enterprises, served as the night’s emcee. The credit union voice is critical, and it needs to be heard, CUNA President/CEO Jim Nussle told attendees Monday at CUNA Governmental Affairs Conference (GAC) during his address. Nussle's speech was streamed live over Facebook and has been viewed more than 1,400 times as of Monday evening. WASHINGTON – At the CUNA Governmental Affairs Conference (GAC), 5,000 credit union professionals from around the country gathered to hear George W. Bush, 43rd President of the United States, discuss the current political, cultural, and financial climate with Credit Union National Association President/CEO Jim Nussle. The February 2018 Credit Union Trends Report from CUNA Mutual Group is now available. America Saves, a campaign managed by the nonprofit Consumer Federation of America, motivates, encourages, and supports low- to moderate-income households to save money, reduce debt, and build wealth. America Saves encourages individuals to take the America Saves pledge and organizations to promote savings year-round and during America Saves Week; February 26-March 2. Several events at next week’s CUNA Governmental Affairs Conference (GAC) will be live streamed on CUNA’s Facebook page for those not in attendance. These include CUNA President/CEO Jim Nussle’s speech, and a presentation on CUNA’s Credit Union Awareness Initiative from Chief Strategic Communications Officer Douglas Kiker. What a year it’s been—just one month into 2018 and there are already 3,151 scams added to the Better Business Bureau (BBB) Scam Tracker℠… and counting. That is good news, sort of, because last year at the same time there were already 3,932 scams found. MADISON, Wis. – After an illustrious and influential career spanning over 13 years with the National Credit Union Foundation (the Foundation), National Program Director Lois Kitsch is set to retire from the Foundation effective May 1st. This year's CUNA Government Affairs Conference (GAC) features some big names. ALEXANDRIA, Va. – The video recording of the Jan. 25, 2018, open meeting of the National Credit Union Administration Board is now available on the agency’s Web site. WASHINGTON — The Consumer Financial Protection Bureau (CFPB) released its five-year Strategic Plan that establishes its mission, strategic goals, and strategic objectives. CUNA supports easy access to credit scores, but told the Consumer Financial Protection Bureau (CFPB) in a letter Friday that it may not be feasible for all institutions to offer such scores free of charge. CUNA wrote to the bureau in response to its request for information on consumers’ experience with access to credit scores. HIGHTSTOWN, N.J. – The New Jersey Credit Union Foundation welcomed West Orange Municipal FCU President/CEO Dawn Brockup as its newest board member at its latest board meeting held in January. KANSIS CITY –The Wall Street Journal (WSJ) has reported that the Federal Reserve Bank of Kansas City has granted conditional approval to a Colorado credit union to serve marijuana businesses. “Though, to win the Fed’s backing it agreed to step back from its original plan to serve state-licensed dispensaries,” according to the article. Children’s hospitals rely on donations to provide care for kids — no matter their illnesses or injuries. Help spread this message during #ChildrensHospitalsWeek, March 5-11. U.S. data breaches in 2017 hit a new record high of 1,579 – nearly doubling over the number of breaches in 2016, according to the Identity Theft Resource Center (ITRC). Low-income credit unions in Florida, Puerto Rico, Texas, and the U.S. Virgin Islands, areas hit hardest by hurricanes Harvey, Irma, and Maria last fall, have a special opportunity to seek certification as Community Development Financial Institutions (CDFIs) through the NCUA. CUNA supports adding a third, same-day automated clearing house (ACH) processing window, but remains concerned about utility versus cost that some credit unions may incur, it told NACHA-The Electronic Payments Association in a letter Friday. CUNA responded to a series of questions posed by NACHA regarding same-day ACH. Following an impactful career spanning over 10 years with the National Credit Union Foundation, Senior Program Manager Mark Lynch will be retiring from the Foundation at the end of January 2018. The National Credit Union Foundation has announced the addition of Rebecca Dopart as the new Director of Philanthropy, effective January 16, 2018. MADISON, Wis. – Credit union organizations can now apply for a Biz Kid$ Financial Education Grant from the National Credit Union Foundation (the Foundation) through March 31, 2018. The Foundation is looking to distribute up to $75,000 in grant funds to credit union organizations as part of this effort. CUNA announced the 647 credit union board members who earned pins and certificates through the CUNA Volunteer Achievement Program in 2017. The National Credit Union Administration (NCUA) has created, as part of its agency-wide realignment to better focus resources in a changing financial services environment, the Office of Credit Union Resources and Expansion (CURE). CURE began operations on January 7, 2018 and will support low-income-designated credit unions and credit unions interested in a low-income designation; minority credit unions; credit unions seeking changes in their charters, bylaws, or fields of membership; and groups organizing to start new credit unions. Wednesday, the agency held a webinar on CURE that will be archived and available to view in approximately three weeks, click here to register for access. MADISON, Wis. – At its December 12, 2017 meeting, the National Credit Union Foundation (the Foundation) board of directors elected Robert Cashman, President/CEO at Metro Credit Union in Chelsea, Mass. ; Timothy Kovac, Vice President & Associate General Counsel, Business Compliance & Regulatory Leader for Legal Operations at CUNA Mutual Group in Madison, Wis.; Samantha Paxson, EVP & Chief Marketing and Experience Officer at CO-OP Financial Services in Rancho Cucamonga, Calif.; and Brett Thompson, President/CEO at the Wisconsin Credit Union League in Madison, Wis. to the Foundation board. A television advertisement featuring local credit union leaders captured the spirit of the holidays and gained exposure for local Children’s Miracle Network Hospitals in the Wichita Falls, Texas area. Continued lending strength as consumers prepared for the holidays highlighted November’s monthly credit union estimates. Governor Chris Christie on Thursday declared a state of emergency in four counties along the Jersey shore as a blizzard hit the state. In a tweet, the governor said he had made the emergency designation for Cape May, Atlantic, Ocean and Monmouth counties. ATLANTIC CITY, N.J. – The New Jersey Coalition for Financial Education (NJCFE), through partnerships with NJSaves and Clarifi, is hosting its 3rd Annual Job Help and Financial Fitness Expo conveniently located at Bally’s on the boardwalk in Atlantic City on February 28, 2018. This Expo is open to the public and kicks-off America Saves Week, taking place February 26-March 2. NCUA’s Office of Credit Union Resources and Expansion (CURE) begins operations Jan. 7, and credit unions can learn about what CURE is offering on an agency webinar scheduled for Jan. 10. WASHINGTON, D.C. — The Consumer Financial Protection Bureau (CFPB) released its biennial report on the state of the credit card market. The report found that the total amount of credit line, number of accounts, average amount of card debt, and enrollment in online services have all increased over the past several years. The report found also that cardholders average fewer credit cards than before the recession, and more are signing up for secured cards that require a cash deposit. ALEXANDRIA, Va. – The video recording of the Dec. 14, 2017, open meeting of the National Credit Union Administration Board is now available on the agency’s Web site. The Consumer Financial Protection Bureau (CFPB) announced the launch of the HMDA Check Digit Tool and Rate Spread Calculator. The CFPB provides the new Rate Spread Calculator for use with data collected in or after 2018. The Check Digit Tool and Rate Spread Calculator will remain available to financial institutions throughout the 2018 collection period and thereafter to support calculation of data field values required for reporting HMDA data. ALEXANDRIA, Va.— NCUA has outlined its supervisory priorities for 2018. ALEXANDRIA, Va. – The National Credit Union Association’s (NCUA) new Office of Credit Union Resources and Expansion (CURE) will begin operations on Jan. 7, 2018, and credit unions can learn about what CURE is offering on an agency webinar scheduled for Wednesday, Jan. 10, 2018. Children’s Miracle Network Hospitals and Credit Unions for Kids announced the five winners of the 2017 Vote for Miracles campaign. Over the course of three weeks, more than 600,000 votes were cast more than doubling the vote total for last year’s promotion. In addition, members representing more than 3,000 credit unions cast votes during the campaign. CUNA and other trade organizations highlighted what data breach legislation should look like to leadership of the House Energy and Commerce Committee this week in response to a request for comments on such legislation. CUNA supports strong national data security and breach notification requirements. ALEXANDRIA, Va. – Federally insured credit unions across the country saw loans grow at a faster rate in the third quarter than a year earlier, while assets and shares grew more slowly, according to state-level data compiled by the National Credit Union Administration. The 2017 #VoteforMiracles promotion ends today after establishing a record of more than 500,000 votes over the three-week campaign. The voting, which will conclude at 11:59 P.M. CST this evening, is expected to heat up over the final few hours as the competition remains tight among the leading hospitals vying for $100,000 in prize money. CUNA and other organizations wrote to Acting IRS Commissioner David Kautter Friday with concerns that a recent change to the tax transcript process could adversely impact the residential mortgage industry. CUNA has announced three keynote speakers at the 2018 CUNA Governmental Affairs Conference (GAC), scheduled for Feb. 25 to March 1, 2018. ANN ARBOR, Mich. – CFI Group just released its 2017 Credit Union Satisfaction Index (CUSI), a survey of U.S. credit union members asking about their experience with their credit union. At the end of 2017, credit union satisfaction among members remains at 84, as measured on a 0-100 scale, showing no change from 2016. More than 100,000 fans of Children’s Miracles Network Hospitals have helped #VoteForMiracles surpass 300,000 votes with one week left in the campaign. More than 2,500 credit unions have also been recognized by the public who are asked during the voting process to “Choose their Credit Union”. CUNA stressed the need for Bank Secrecy Act (BSA) compliance reporting relief and a return to the 1.3% net operating level in its comments on NCUA’s strategic plan for 2018-2022. Children’s Miracle Network Hospitals’ #VoteForMiracles has surpassed 100,000 votes almost a full week ahead of the pace set at the same time last year. MADISON, Wis. – Credit union leaders and supporters can now purchase their sponsorships and tickets for the 30th annual National Credit Union Foundation Dinner Presenting the Herb Wegner Memorial Awards. The dinner will take place on February 26, 2018 at the Marriott Marquis in conjunction with the Credit Union National Association (CUNA) Governmental Affairs Conference (GAC) in Washington, D.C. Check out this month's edition of CUNA Economic Update to hear from CUNA vice president of economics and statistics, Mike Schenk. ALEXANDRIA, Va. – Twenty-three federally insured, low-income credit unions in 17 states have been awarded $536,000 in grants to support outreach to underserved members, the National Credit Union Administration (NCUA) announced. Six NJCUL-member credit unions were awarded a total of $46,600 during this grant round: 1st Bergen FCU, Deepwater Industries FCU, Local 1233 FCU, Members 1st of NJ, MidState FCU, and Jersey Central FCU. According to a Credit Union Times article published this week, a New Jersey attorney and a real estate agent were charged with allegedly running a massive mortgage fraud scheme. The scam caused more than $30 million in losses for at least five financial institutions, according to a criminal complaint filed last week in U.S. District Court in Newark. Prosecutors did not identify the financial institutions, and they did not respond to a CU Times request for additional information, according to the publication. MADISON, Wis. – 47 credit union professionals became Credit Union Development Educators (CUDEs) after being guided by dedicated program facilitators and mentors through the intensive Credit Union Development Education (DE) Training from the National Credit Union Foundation (the Foundation). The DE training was held November 1 - 8, 2017 at the Lowell Center in Madison, Wis.
NASHVILLE, Tenn. -- CUNA Lending Council presented its 2017-2018 executive committee and the 2017 CUNA Lending Council Award winners at its 2017 CUNA Lending Council Conference on November 12-15. MADISON, Wis. – In recognition for his almost forty years of service to the credit union movement and innovative spirit pushing the movement forward, the National Credit Union Foundation (the Foundation) is pleased to announce Chuck Purvis, President/CEO at Coastal Credit Union, as the recipient of a 2018 Herb Wegner Memorial Award for Outstanding Individual Achievement. Credit union loans and memberships continue to grow at historically high rates, based on the results CUNA's September Monthly Credit Union Estimates. MADISON, Wis. – The National Credit Union Foundation (the Foundation) recently wrapped up a year-long grant funding effort to conduct consumer financial health check-ups with the Center for Financial Services Innovation (CFSI). This work, generously funded and supported by CUNA Mutual Group, included financial health check-ups for: Affinity Plus Federal Credit Union in St. Paul, Minn.; BECU in Tukwila, Wash.; Community Financial Credit Union in Plymouth, Mich.; IH Mississippi Valley Credit Union in Moline, Ill.; University FCU in Austin, Texas; and Virginia Credit Union in Richmond, Va. Thanks to a grant from the National Credit Union Foundation, students attending reality fairs can use their mobile phone or tablet in place of pen and paper. ‘Tis the Season…For Fun CMNH Fundraisers! As the weather changes and we roll into the fall and holiday season, check out some new and fun seasonal fundraising campaigns benefiting Children’s Miracle Network Hospitals that you can offer to your employees and members. ALEXANDRIA, Va. – National Credit Union Administration Board Chairman J. Mark McWatters and Board Member Rick Metsger issued statements Thursday on the eve of Veterans Day (observed). MADISON, Wis. – In recognition of his decades of service as a dedicated advocate of the credit union movement and a mentor and inspiration to industry luminaries, the National Credit Union Foundation (the Foundation) is pleased to announce Bill Hampel, retired Chief Policy Officer and Economist at Credit Union National Association (CUNA), as the recipient of a 2018 Herb Wegner Memorial Award for Outstanding Individual Achievement. OTTAWA, Canada – While 15% of U.S. consumers spotted fraudulent activity on their accounts last year, banks and credit unions responded successfully, with 85% of those consumers saying they were satisfied with how their financial institution handled the incident, according to a new survey commissioned by the Ottawa, Canada-based March Networks. In a Q&A in its “Dave Says” column this week, the NJ Herald outlined the stark differences between banks and credit unions as well as the benefits of credit union membership. Today, October 19, is International Credit Union Day, when credit unions remind their members that they can achieve their biggest goals in life with the theme "Dreams Thrive Here." MADISON, Wis. – The National Credit Union Foundation (the Foundation) has announced the winners of the 2018 Herb Wegner Memorial Awards. Angel V. Castro, Bill Hampel, Susan Mitchell and Chuck Purvis will be recognized with Outstanding Individual Achievement awards by the Foundation. PHILADELPHIA – The Southern Chapter of Credit Unions met on October 10th at Children’s Hospital of Philadelphia (CHOP) for the first meeting of the 2017-2018 chapter year. Participants were hosted by Francesca Cosmi, coordinator, cause marketing and Children’s Miracle Network (CMN) at CHOP’s Buerger Center for Advanced Pediatric Care (Raymond G. Perelman Campus). MADISON, Wis., and WASHINGTON – CUNA has just released the October edition of the CUNA Economic Update. Sponsored by CUNA CFO Council and hosted by Jordan van Rijn, senior economist at CUNA, the update this month considers the effects of the credit union movement along with updated national economic prospects. MADISON, Wis. – The National Credit Union Foundation (the Foundation) is now accepting donations through the online disaster relief system CUAid.coop to raise money for credit union people affected by wildfires in Northern California. Credit union supporters in every state can make donations to the General Disaster Relief Fund at cuaid.coop. National Credit Union Foundation Director of Communications Christopher Morris appeared on CUBroadcast Thursday to provide an update on how credit unions have stepped up in a major way to support credit unions and their members impacted by Hurricanes Harvey, Irma, and Maria. Morris reports that more than $2.3 million in donations have been recorded so far to help those in Texas, Florida, and Puerto Rico. WASHINGTON – CUNA will detail credit unions’ legal rights resulting from the Equifax data breach during a member-only conference call Tuesday at 4 p.m. Registration is now open for the free conference call. In response to the severe and extensive damage caused by Hurricanes Harvey, Irma and Maria, the Federal Home Loan Bank of New York (“FHLBNY”) has made $1 billion in disaster relief funding available to its members to help rebuild communities in FEMA-designated disaster areas in Puerto Rico, the U.S. Virgin Islands, Florida, Texas and the Southeast. The funds are being made available by the FHLBNY through its Community Lending Programs (“CLP”) to be used as both immediate gap financing and longer-term funding to restore homes and businesses. WASHINGTON – CUNA announced Friday that the association will file a lawsuit against Equifax to protect credit unions and their members from harm as a result of the Equifax data breach. MADISON, Wis. – The National Credit Union Foundation (the Foundation) is now accepting donations through the online disaster relief system CUAid.coop to raise money for credit union people affected by Hurricane Maria. Credit union supporters in every state can make donations to the General Disaster Relief Fund at cuaid.coop. Credit unions across the United States are invited to celebrate International Credit Union Day on Thursday, October 19 by participating in Shop for Miracles, a one-day Credit Unions for Kids program that raises funds for local Children's Miracle Network Hospitals. CUNA and the National Credit Union Foundation are participating in the National Cooperative Business Association’s National Co-Op Festival, Sept. 30 and Oct. 1, taking place on the National Mall in Washington, D.C.
ATLANTA – The Board of Equifax Inc. announced today that Richard Smith will retire as Chairman of the Board and Chief Executive Officer, effective September 26, 2017. The announcement comes amidst that credit bureau’s major data breach affecting over 143 million Americans' personal information, about half of the U.S. population. The company also faces multiple federal investigations over its handling of the hack and reports that executives sold an unusual amount of stock before the breach was publicly disclosed, according to the Washington Post. MADISON, Wis. & WASHINGTON – CUNA has released a brand-new version of its CUNA Peer Profile Report, a free resource for CUNA members that allows credit unions to compare their recent performance data with that of their closest peers in the industry. The World Council of Credit Unions has activated its Caribbean Relief Fund in response to Hurricane Irma. HIGHTSTOWN, N.J. – Gary Chizmadia, Chairman of the Board at Credit Union of New Jersey and South-Central Chapter President, led the South-Central Chapter meeting at the New Jersey Credit Union League Tuesday. The meeting’s discussion focused on the chapter system—its past, present, and future—and upcoming educational offerings from the League. ONTARIO, Calif. – Fresh into being a mere “start-up,” Plexcity is reaping noticeable attention in the credit union industry as it matures beyond those boundaries into a respected partner that is helping empower credit union trade associations and affiliate organizations—a goalpost its visionaries have worked tirelessly to reach. MIAMI, Fla. – The National Credit Union Foundation (the Foundation) has activated the online disaster relief system CUAid.coop to raise money for credit union people affected by Hurricane Irma. Credit union supporters in every state can make donations at cuaid.coop. Click here to make a donation. WASHINGTON, D.C., RANCHO CUCAMONGA, Calif., and ST. PETERSBURG, Fla. – Credit Union National Association (CUNA), CO-OP Financial Services, and PSCU have collaborated on a system-wide disaster response for the credit union movement. Special toll-free numbers dedicated to helping credit union members with access and branch information as they may be displaced or their institution unavailable due to Hurricanes Harvey and Irma are now available. On Tuesday, the National Credit Union Administration (NCUA) announced it awarded more than $1.8 million in grants to 251 low-income credit unions. Six (6) NJCUL-member credit unions were awarded a total of $46,600 during this grant round: Local 1233 FCU, 1st Bergen FCU, Deepwater Industries FCU, Members 1st of NJ, MidState FCU, and Jersey Central FCU. In all, the agency received applications from 328 credit unions requesting more than $2.4 million. As of Monday afternoon, the National Credit Union Foundation’s CU Aid and the Cornerstone Credit Union Foundation have collected more than $771,000 to support the needs of employees and volunteers of credit unions. Roughly $198,000 has come in through the Cornerstone Credit Union Foundation with the remaining contributions having been made to CU Aid. MADISON, Wis. — The Credit Union National Association (CUNA) announced Thursday it is donating $50,000 to Harvey relief efforts through CUAid, the National Credit Union Foundation’s disaster relief system. As part of its 2017 grant round, NCUA is accepting grant applications from eligible low-income credit unions for a grant to support projects that reach people living in our nation’s underserved communities. The maximum award is $25,000 dollars. Applications for funding under the outreach to underserved communities initiative must be received no later than Aug. 31 at 3 p.m. Eastern. An online application form, an explanation of grant’s requirements, and other information are available on NCUA’s Web site. Houston, Texas – The National Credit Union Foundation (the Foundation) has activated the online disaster relief system CUAid.coop to raise money for credit union people in Texas affected by Tropical Storm Harvey. Credit union supporters in every state can make donations at cuaid.coop. The ICU day video is ready and available for you to share with your members! ALEXANDRIA, Va. – The National Credit Union Administration is hosting its third and final round for credit unions to qualify to use the streamlined application for certification as community development financial institutions. ONTARIO, Calif. – Plexcity has chosen Gravitate Solutions to be the sole implementation and development partner for Plexcity’s trade association clients—many of which are state credit union leagues and industry affiliates. MADISON, Wis. – The national Credit Union Foundation this week launched a new suite of session materials on leveraging the credit union difference for CUs to use to train new employees, board members, etc. Madison, Wis. – The National Credit Union Foundation’s (the Foundation) board of directors has approved 12 new Biz Kid$ Financial Education Grants for 2017-2018, totaling $68,500. These grants are distributed to encourage credit union organizations to use Biz Kid$ and its curriculum to improve students’ financial well-being. Biz Kid$ is the credit union funded public television series that teaches kids about money management and entrepreneurship. Wells Fargo was under fire again this week—less than a year after the scandal involving the bank opening millions of unwanted accounts for customers—this time for signing up auto-loan customers for insurance they didn't need. CUNA joined with other financial service organizations in filing a comment letter with the Federal Reserve Board regarding a proposed revision to Regulation CC. 49 Dairy Queens Across Northern and Central New Jersey Celebrated Miracle Treat Day for CMNH! On Thursday, July 27th, 49 Dairy Queens across New Jersey served hundreds of happy customers their favorite blizzards; giving back $1 or more to their local Children's Miracle Network Hospital, Children's Specialized Hospital, with every blizzard sold that day. RICHMOND, Va. and BEDFORD, Texas – Markel Corporation (“Markel”) (NYSE: MKL) and State National Companies, Inc. (NASDAQ: SNC) announced that they have entered into a definitive agreement under which Markel will acquire all of the outstanding shares of State National common stock for $21.00 per share in cash. The transaction has a total value of approximately $919 million. ALEXANDRIA, Va. — The National Credit Union Administration’s new Learning Management Service is up and running, and the agency is hosting a webinar to help credit unions learn about the service’s training resources on regulatory, operational and strategic subjects. BOSTON – At its Annual Meeting and Awards Dinner, the National Youth Involvement Board (NYIB) recognized the New Jersey Credit Union Financial Reality Fairs Program for the most students reached by a team. VIENNA, Austria — Brian McCrory has been elected the Chair of World Council of Credit Unions Board of Directors. McCrory, who succeeded Daniel Burns, representing the Irish League of Credit Unions, formally took office during the World Credit Union Conference Annual General Meeting on Monday, 24 July in Vienna, Austria. League InfoSight, a collaborative effort of credit union leagues, including PCUA, announced that Glory LeDu was appointed as CEO by the board of directors. She will be responsible for continuing to deliver collaborative and effective regulatory compliance solutions to credit unions directly through league/association partners. Madison, Wis. – Nearly a hundred certified Credit Union Development Educators (CUDEs) gathered in Tampa, Fla. recently to celebrate the 35th anniversary of the Credit Union Development Education (DE) Program. The popular philosophy training program from the National Credit Union Foundation (the Foundation) started in 1982 and continues to educate credit union professionals from around the world every year. MADISON, Wis. – World Council of Credit Unions (WOCCU) announced the 2017 International Credit Union (ICU) Day® theme — "Dreams Thrive Here" — celebrating the spirit of the global credit union movement. ICU Day is celebrated annually on the third Thursday of October and will take place this year on October 19. NEW BRUNSWICK, N.J. – You are invited to Rutgers University’s 5th Annual Training Showcase. Come preview the exciting new options Rutgers Workforce Development Unit has to offer. Make Your Financial Education Count! Deadline for Reporting to NYIB is FRIDAY, July 7th! Is your credit union out in the schools, youth agencies and communities spreading financial education? Do you hold financial workshops that involve kids and/or young adults (through age 22)? The League encourages you to report your presentations on the National Youth Involvement Board Web site www.nyib.org by this year’s deadline: Friday, July 7th. MADISON, Wis. – Registration is now open for the November 2017 session of the Credit Union Development Education (DE) training, which takes place November 1 - 8, 2017 in Madison, Wis. Attendees of the National Credit Union Foundation’s (the Foundation) six-day total immersion experience will learn critical lessons in cooperative principles, credit union philosophy and international development issues while incorporating challenges credit unions face today. NEW YORK – A Florida man was sentenced on Tuesday to 5 1/2 years in prison after being found guilty of operating an illegal bitcoin exchange suspected of laundering money for hackers and linked to a data breach. VINELAND, N.J. – The Southern Chapter of Credit Unions held a meeting Wednesday at the Hampton Inn in Vineland. The meeting covered various topics, including the election of chapter officials. Join the League and Unite With Your Community at National Night Out! National Night Out, taking place August 1st, 2017, unites law enforcement and neighbors to create a true sense of community. Keeping with the credit union philosophy of "People Helping People", the League will be participating this year in the festivities in its local community of East Windsor. The Northern Chapter Meeting originally scheduled for this Wednesday, June 21, 2017 has been postponed to Wednesday, September 13, 2017 at the Iberia Pennisula, Ferry Street, Newark, N.J. If you have any questions, please reach out to Chapter President Shirley A. McClinton-Watson at (973) 896-5221 or shirwatson@yahoo.com. MADISON, Wis. – Forty-eight credit union professionals became Credit Union Development Educators (CUDEs) after being guided by dedicated program facilitators and mentors through the intensive Credit Union Development Education (DE) Training from the National Credit Union Foundation (the Foundation). The DE training was held May 31 – June 7, 2017 at the Lowell Center in Madison, Wis.
ALEXANDRIA, Va. – Federally insured credit unions across the country saw continued improvement in nearly every category during the first quarter of 2017, according to state-level data compiled by the National Credit Union Administration. MADISON, Wis. – With a deadline of July 28, 2017, credit union supporters are encouraged to nominate individuals and organizations for the Herb Wegner Memorial Awards to be presented by the National Credit Union Foundation (the Foundation). Winners will be honored at the Foundation’s annual awards dinner on February 26, 2018 in conjunction with the Credit Union National Association (CUNA) Governmental Affairs Conference (GAC) in Washington, D.C.
ALEXANDRIA, Va. – Data on the financial performance of federally insured credit unions in the quarter ending March 31, 2017, are now available from the National Credit Union Administration. The refund will come in the form of share-insurance fund dividends. ORLANDO – CUNA Chief Economist/Chief Policy Officer Bill Hampel offered good news in his credit union update at the CUNA CFO Council Conference in Orlando: Credit unions can expect a series of refunds on their contribution to the corporate stabilization fund. Earlier this month, NJCUL and CUNA asked for your participation in collecting reliable benchmark data on taxi medallion participation loan operations and experiences. The expectation was that this survey would provide you with meaningful information that would improve your efforts to collect on outstanding loans; provide medallion loan originators with peer comparison data that would improve service quality for participation holders; and provide supervisory authorities with feedback that might compel a more rational and uniform approach to the examination and supervisory process. The summary results are now available in the members-only CUNA-hosted Taxi Medallion Community. The National Credit Union Youth Month’s savings challenge railed young members to deposit $16.8 million in their credit union accounts this April—double the amount deposited during the challenge last year. FAIRFIELD, N.J. – The Norther Chapter of Credit Unions held a meeting Tuesday night at Calandra's Mediterranean Grill in Fairfield where the chapter received an update from NCUA examiner Marcus Vander Wall. The Chapter also held elections for chapter officials during which Shirley A. McClinton-Watson of Newark Board of Education ECU was re-elected as Chapter President. Each year,CUNA’s Credit Union Magazine recognizes the credit union movement’s Rock Stars: Those unique, innovative people who excel in their areas of expertise—and by doing so make our movement a better, more interesting place. ALEXANDRIA, Va. – Low-income credit unions interested in applying for Community Development Revolving Loan Fund grants can begin submitting applications on July 1, the National Credit Union Administration announced. MADISON, Wis. – At its May 12, 2017 meeting, the National Credit Union Foundation (the Foundation) board of directors elected John Sackett, Board Treasurer of Royal Credit Union in Eau Claire, Wis., to the Foundation board. The CUNA Board of Directors recently designated Sackett, a CUNA Board Member, as a CUNA Board representative on the Foundation board. A Web site is now available for credit unions wishing to make a claim to a portion of the Home Depot data breach settlement fund. Claims must be filed by Sept. 14. MADISON, Wis. – Registration is now open for the September 2017 session of the Credit Union Development Education (DE) training, which takes place September 13-20, 2017 in Madison, Wis. Attendees of the National Credit Union Foundation’s (the Foundation) six-day total immersion experience will learn critical lessons in cooperative principles, credit union philosophy and international development issues while incorporating challenges credit unions face today. Mark your calendars for the next big thing in Children Miracle Network Hospital fundraising! Miracle Jeans Day will be September 13 this year! Watch for more information about how you'll be able to wear jeans and help kids in September! To register, visit http://cu4kids.org/miraclejeansday/. MADISON, Wis. – Credit union savings balances grew at a brisk pace in March, according to CUNA’s Monthly Credit Union Estimates. “Overall balances increased by 2.6% in the month—an astounding 31.2% annualized gain and the fastest monthly increase in five years,” said CUNA Senior Economist Mike Schenk. The March increase was a bit faster than February’s gain but the more recent month ended on a Friday so it reflects big payday deposits. HIGHTSTOWN, N.J. – The New Jersey Coalition for Financial Education (NJCFE) hosted a free “Teacher Exchange” Tuesday for those teaching personal finance and financial literacy, including credit unions that offer these educational programs to members and potential members. WASHINGTON – CUNA will join forces with the National Credit Union Foundation today for Financial Literacy Day on Capitol Hill, an event sponsored by the Foundation. Representatives of CUNA and the Foundation will be on-hand this afternoon in the Rayburn House Office Building. WASHINGTON -- Credit unions could play a bigger role in the economy under a tailored regulatory structure, CUNA and all 38 credit union leagues wrote to Senate Banking Committee leadership Friday. In the letter, CUNA and the leagues listed 4 proposals that could create economic growth by fostering a more favorable environment for credit unions. It’s amazing what a little pocket change can do to help a child at a Children’s Miracle Network Hospital. Credit unions locally and across the nation are participating in Change a Child’s Life, a coin drive benefiting their local Children’s Miracle Network Hospital. ALEXANDRIA, Va. – Personal finances and building financial security will be the focus of the National Credit Union Administration’s April 18 Twitter chat, part of the agency’s activities during Financial Capability Month. WASHINGTON – Javelin Strategy & Research and the Electronic Payments Coalition (EPC) released a report last week that reveals small merchants are more concerned with value, and less concerned about price, when it comes to the fees that they pay for debit card transactions. ALEXANDRIA, Va. – Educated consumers are better-prepared to build financial security and protect themselves from scams, and the National Credit Union Administration encourages credit unions to continue helping members better understand personal financial matters during Financial Literacy Month. April means spring, a time of optimism, and credit unions will inspire their members to begin their path toward financial freedom by marking three key celebrations this month. NJ Sharing Network encourages all communities to learn more about the life-saving benefits of organ and tissue donation. Increased awareness can be very helpful when talking with family members, friends and co-workers about the benefits of organ donation. Learn how you can help! MADISON, Wis. – The National Credit Union Foundation (the Foundation) was honored last week with two Diamond Awards, which recognize outstanding marketing and business development achievements in the credit union industry. WASHINGTON – CUNA wrote to House and Senate Appropriations Committee leaders Wednesday urging full funding for the Community Development Financial Institutions (CDFI) Fund, for which the Donald Trump administration has requested Congress to eliminate funding. The fund, administered by the Treasury, makes capital grants, equity investments and awards for technical assistance to certified CDFIs. WASHINGTON – CUNA urged the Treasury’s Financial Crimes Enforcement Network (FinCEN) to ensure any regulatory changes it pursues relating to the collection of information filings be as minimally burdensome on credit unions as possible. CUNA’s letter was sent in response to proposed revisions to the collection of information filings by financial institutions required to file such reports under the Bank Secrecy Act (BSA), which includes credit unions. CUNA, with the generous support of CUNA Mutual Group and CO-OP Financial Services, was able to secure the rights to the .creditunion domain from the Internet Corp. for Assigned Names and Numbers (ICANN). Beginning this summer, credit unions will be able to register and use a .creditunion domain name of their choice to serve as a trusted source identifier on the internet for their members. WASHINGTON – CUNA urged a House subcommittee Tuesday to consider the impact of regulatory burden when examining the availability of credit for consumers and small businesses. CUNA wrote to leadership of the House Financial Services subcommittee on financial institutions and consumer credit for the record of its hearing on the state of lending in America. WASHINGTON – Credit unions across the country will present a $580,485 donation to Children’s Miracle Network Hospitals Sunday, the date of two popular, credit union-hosted races. The Cherry Blossom Ten Mile Run in Washington, D.C. and the Credit Union SacTown Run in Sacramento, California, along with two races overseas, make up the Credit Union Family of Races. MADISON, Wis. – To help kick-off National Financial Literacy Month, the National Credit Union Foundation (the Foundation) is hosting a Twitter chat for credit unions on Wednesday, April 5th at 4 p.m. The Foundation invites credit unions to discuss their financial education activities during the chat. WASHINGTON – CUNA hopes NCUA works to implement the recommendations released this week in a report from Federal Financial Institutions Examination Council (FFIEC) agencies, part of a review of the agencies’ rules. The review was conducted as part of the Economic Growth and Regulatory Paperwork Act (EGRPRA), and while the NCUA was not required to participate, it did so voluntarily. WASHINGTON – A Consumer Financial Protection Bureau (CFPB) led by a single director is not working for credit unions and has created a rigged system benefitting large banks, CUNA wrote to the House Financial Services subcommittee on oversight and investigations Tuesday. WASHINGTON – CUNA will show the House Financial Services oversight and investigations subcommittee how the Consumer Financial Protection Bureau’s (CFPB) structure impacts credit unions and their members. The subcommittee is conducting a hearing Tuesday at 10 a.m. examining the bureau’s structure. Are you looking for financial literacy curriculum? Want to learn about Reality Fairs? Student branches? How to reach the college audience? Or just want some fresh ideas to add to your financial education outreach? Then you should be at the 2017 NYIB conference! Article originally featured in CU Journal. WASHINGTON – In a budget that was otherwise relatively short on specifics, the Trump administration on Thursday called for eliminating the Treasury Department’s grant programs for community development financial institutions, a popular industry feature that helps impoverished communities access financial services. WASHINGTON – As a strong supporter of programs that help credit unions better serve their members, CUNA pledged to support funding for the U.S. Treasury’s Community Development Institutions (CDFI) Fund, funding for which was eliminated in President Donald Trump’s budget proposal released last week. MADISON, Wis. – In an effort to support the movement’s small credit unions, CUNA recently created the CUNA Small Credit Union Community, an online platform where small credit union leaders from across the country can share ideas, collaborate and solve problems collectively. WASHINGTON – The Department of Labor (DOL) should delay its fiduciary rule by at least 180 days, CUNA wrote in a letter to the agency Thursday. In the letter, CUNA also called for additional efforts and research to ensure that credit union members are not harmed by unintended consequences of overly broad rules. WASHINGTON – The NCUA filed a response to the lawsuit against its final field-of-membership (FOM) rule brought by the American Bankers Association (ABA). CUNA is tracking the lawsuit, and plans to support the NCUA in its defense of the rule. WASHINGTON – The Federal Open Market Committee decided Wednesday to raise the federal funds interest rate range from 0.75% to 1%. CUNA says the action was expected, and CUNA anticipates similar actions later this year. ​ALEXANDRIA, Va. – Federally insured credit unions saw continued improvement in nearly every category during the fourth quarter of 2016, according to state-level data compiled by the National Credit Union Administration. NEW YORK – The National Federation of Community Development Credit Unions will host a Webinar to explain the latest changes to the community development financial institution (CDFI) application process. The Webinar will be held at 2 p.m.
MADISON, Wis. – Credit union organizations have until March 31, 2017 to apply for a Biz Kid$ Financial Education Grant from the National Credit Union Foundation (the Foundation). The Foundation is looking to distribute up to $75,000 in grant funds to credit union organizations as part of this effort. ALEXANDRIA, Va. – The National Credit Union Administration released its 2016 Annual Report, highlighting the agency’s activities, policy initiatives, and accomplishments for 2016. 7th Annual NJ CU Foundation Night Was a Sure Bet! ISELIN, N.J. – Thursday’s 7th Annual New Jersey Credit Union Foundation Casino Night fundraiser brought together credit union industry leaders, volunteers, and friends from around the state for a Texas Hold ‘Em Tournament and casino table games, all for a great cause! The final numbers aren’t yet available, but it looks like the 7th Annual Casino Night was a success for the New Jersey Credit Union Foundation. WASHINGTON – CUNA encourages Congress to improve credit unions’ ability to offer Small Business Administration (SBA) 7(a) loans, as well as other government guaranteed loans, CUNA President/CEO Jim Nussle wrote to leadership of a U.S. House Small Business subcommittee Thursday. SBA 7(a) and other government-guaranteed loans are important to credit unions because the guaranteed portions of the loan do not count against the member business lending cap. WASHINGTON – CUNA and the National Association of Federally-Insured Credit Unions (NAFCU) issued a statement Thursday on the Independent Community Bankers of America (ICBA) not filing any appeal, which was due Feb. 23, over U.S. District Court Judge James Cacheris’ granting the NCUA’s motion to dismiss the banking trade's lawsuit against NCUA and its member business lending rule. ALEXANDRIA, Va. – The National Credit Union Administration released the new credit union system financial performance figures based on Call Report data submitted to and compiled by the agency for the quarter ending Dec. 31, 2016. NEW YORK – On behalf of America’s credit unions, the National Credit Union Foundation (the Foundation) accepted the U.S. Gold President’s Volunteer Service Award for the 2015-2016 school year. This award was presented by Junior Achievement (JA) USA, an official certifying organization for this award, at JA’s 2017 Volunteer Summit on March 7, 2017 for the over 15,000 volunteer hours dedicated to Junior Achievement programs by America’s credit unions. WASHINGTON – CUNA continued its efforts to achieve faster payments last week, participating in a two-day meeting of the Federal Reserve’s Faster Payments Task Force in Atlanta. The task force released the first part of its final report in January, and last week’s meeting discussed the forthcoming second half of the report. BEDMINSTER, N.J. – Gary Tantleff, UBS Financial Services Managing Director - Investments, has once again been named Barron’s #1 Financial Advisor in New Jersey. ALEXANDRIA, Va. – The Temporary Corporate Credit Union Stabilization Fund has received a seventh consecutive clean audit opinion, the NCUA announced Tuesday. WASHINGTON – Incoming CUNA Board Chair Pat Jury pledged to spend his year as chair leading with “strength and determination” in his remarks Tuesday at CUNA Governmental Affairs Conference. WASHINGTON – The National Credit Union Foundation (the Foundation) presented three Herb Wegner Memorial Awards at its annual dinner Monday night at the Marriott Marquis in conjunction with the Credit Union National Association (CUNA) Governmental Affairs Conference (GAC) in Washington, D.C. Denise Gabel, Chief Operating Officer of the Northwest Credit Union Association, served as the night’s emcee. Outstanding Program: The Cooperative Trust from Filene Research Institute. WASHINGTON – With this year’s CUNA Governmental Affairs Conference (GAC) less than a week away, a number of key policymakers have been confirmed to address the more than 5,000 credit union leaders in attendance. A complete list of CUNA GAC keynote speakers and breakout sessions can be found at cuna.org/gac. PITTSBURGH – A magistrate judge in the Wendy’s data breach lawsuit has recommended denying the restaurant chain’s motion to dismiss, according to an interim ruling released this week. CUNA urged the court to reject the motion to dismiss in a brief filed in September with the U.S. District Court for the Western District of Pennsylvania. WASHINGTON – CUNA President/CEO Jim Nussle appeared on CNBC’s Squawk on the Street Friday morning to discuss a number of issues facing the administration. Nussle served as director of the Office of Management and Budget from September 2007 to January 2009. WASHINGTON – Credit union leaders continue to highlight the movement’s pro-consumer attributes in the pages of local publications across the nation. The pieces reinforce the work of CUNA’s Campaign for Common-Sense Regulation, a bipartisan, pro-consumer campaign to achieve regulatory relief through legislative and regulatory advocacy. WASHINGTON – CUNA President/CEO Jim Nussle highlighted the need for common-sense regulatory relief in a letter to the editor published in USA Today Sunday. Weighing in on the debate over the future of the Consumer Financial Protection Bureau (CFPB), Nussle lamented the effects of one-size-fits-all regulation. WASHINGTON – CUNA and its system partners are working hard to make the first CUNA Governmental Affairs Conference’s (GAC) giveback event a huge success. Attendees are asked to bring items for a donation drive in support of Bright Beginnings, a nationally accredited child and family development center that offers a bright start for homeless infants, toddlers, preschoolers and their families in Washington, D.C.
MADISON, Wis. – CUNA published a white paper Thursday examining three policy decisions the NCUA will need to make concerning the wind-down of the agency’s Corporate Resolution Program. CUNA, the leagues and member credit unions will analyze the issues over the coming months and provide recommendations to the NCUA. WASHINGTON – CUNA’s Project Zip Code has matched its 90 millionth credit union member to their congressional district, a major milestone for one of the CUNA/League-system’s signature advocacy tools. Project Zip Code matches credit union membership data to congressional and state legislative districts, as well as counties. MADISON, Wis. – With CUNA's Campaign for Common-Sense Regulation underway and CUNA Governmental Affairs Conference less than a month away, CUNA has been on Capitol Hill talking to members of Congress and key committee staffers. MADISON, Wis. – Registration is now open for the second Credit Union Development Education (DE) training of 2017, which takes place May 31 – June 7, 2017 in Madison, Wis. Attendees of the National Credit Union Foundation’s (the Foundation) six-day total immersion experience will learn critical lessons in cooperative principles, credit union philosophy and international development issues while incorporating challenges credit unions face today. WASHINGTON – J. Mark McWatters was named acting chairman of the NCUA board Thursday by President Donald Trump. McWatters has served as a board member since August 2014. WASHINGTON – The U.S. District Court of the Eastern District of Virginia granted the NCUA’s motion to dismiss an Independent Community Bankers of America (ICBA) lawsuit against the agency and its member business lending (MBL) rule Tuesday. CUNA, along with National Association of Federally Insured Credit Unions (NAFCU), filed an amicus brief in support of dismissal. MADISON, Wis. – The deadline is approaching for credit union leaders and supporters to purchase their sponsorships and tickets for the 29th annual National Credit Union Foundation Dinner Presenting the Herb Wegner Memorial Awards. The dinner will take place on February 27, 2017 at the Marriott Marquis in conjunction with the Credit Union National Association (CUNA) Governmental Affairs Conference (GAC) in Washington, D.C.
MADISON, Wis. – Registration is now open for the first Credit Union Development Education (DE) training of 2017, which takes place April 26 – May 3, 2017 in Madison, Wis. Attendees of the National Credit Union Foundation’s (the Foundation) six-day total immersion experience will learn critical lessons in cooperative principles, credit union philosophy and international development issues while incorporating challenges credit unions face today. The Consumer Financial Protection Bureau announced a “Your Money, Your Goals” Webinar on its latest resource: "Behind on Bills". This Webinar will provide an overview of the new resource and how you can use it with the people you serve. WASHINGTON – In a study released this week, Pew Charitable Trust makes sweeping conclusions about overdraft services for all consumers based on a study that looks at the practices of a small number of hand-picked banks. SALT LAKE CITY – Children’s Miracle Network Hospitals and Credit Unions for Kids announced the five winners of the 2016 “Vote for Miracles” promotion. Over the course of 22 days, almost 300,000 votes were cast for 141 CMN Hospitals. In addition, members representing more than 2,500 credit unions cast votes during the campaign. The December 2016 Credit Union Trends Report from CUNA Mutual Group is now available. MADISON, Wis. – At its December 9, 2016 meeting, the National Credit Union Foundation (the Foundation) board of directors elected Kathy Garner, president/CEO of Catalyst Corporate FCU in Plano, Texas, and Carlyn Roy, president/CEO of TAPCO CU in Fircrest, Wash., to the Foundation board. ALEXANDRIA, Va. – The U.S. District Court for the Eastern District of Virginia is scheduled to take up NCUA’s motion to dismiss the Independent Community Bankers of America’s (ICBA) lawsuit challenging the agency’s member business lending rule today. CUNA and the National Association of Federal Credit Unions (NAFCU), which have jointly moved to file an amicus brief, will be present. 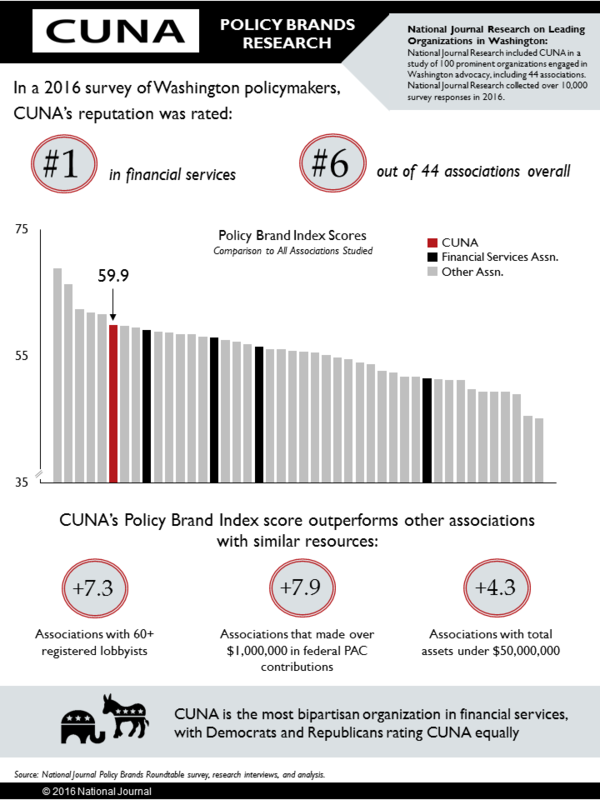 WASHINGTON – A National Journal survey of policymakers found the CUNA/League system ranked first among all financial services trade associations studied in terms of advocacy effectiveness. This quantitative analysis, based on a survey of policymakers who were aware of CUNA, found the CUNA/League system to be 6th out of the top 44 associations studied across all industries. ​ALEXANDRIA, Va. – Federally insured credit unions saw continued improvement in nearly every category during the third quarter of 2016, according to state-level data compiled by the National Credit Union Administration released Monday. From now through December 20, individuals are voting for their favorite Children’s Miracle Network (CMN) Hospital to win up to $50,000 at VoteForMiracles.org. Distressed Mortgage Rate Still Highest in N.J.
New Jersey has led the nation in the percentage of residential mortgages considered “distressed” for the third year in a row according to the latest numbers from the Mortgage Bankers Association. MADISON, Wis. – As the end of the year approaches, the National Credit Union Foundation (the Foundation) is hosting a “Special Holiday Edition” of their bi-monthly Twitter chats for credit unions on Thursday, December 8th at 4 pm. The Foundation invites credit unions to discuss their efforts to help staff, members and communities during the holiday season. Vote for your favorite Children’s Miracle Network (CMN) Hospital on Tuesday, November 29! Enter your email address at www.VoteforMiracles.org to receive an email reminder when the promotion begins. It could be the difference in helping your local CMN Hospital win a share of $100,000 through #VoteForMiracles. SALT LAKE CITY – Children’s Miracle Network Hospitals announced a nationwide “Vote for Miracles” campaign celebrating the 20th anniversary of the Credit Unions for Kids program. From November 29 through December 20, credit unions and the general public are invited to cast their votes to support their favorite CMN Hospital. At the conclusion of the promotion, the top five hospitals will be awarded a total of $100,000 on behalf of “credit unions”, compliments of CO-OP Financial Services. MADISON, Wis. – The National Credit Union Foundation (the Foundation) is looking for credit unions to submit proposals leveraging the Center for Financial Services Innovation’s (CFSI) consumer financial health assessment tool. CFSI is one of the leading organizations dealing with the subject of consumer financial health. CFSI’s Consumer Financial Health Study found that 57% of Americans are financially unhealthy, lack daily financial systems that serve them well, struggle to weather financial shocks, and are not well-positioned to pursue their financial aspirations. MADISON, Wis. – The National Credit Union Foundation is looking for credit unions to submit proposals leveraging the Center for Financial Services Innovation’s (CFSI) consumer financial health assessment tool.